A Very elaborate room setting for your Bespaq Dutch Baby House. One entire wall is fitted with built-in bookcases, cabinets and a lovely fireplace. Framed arrwork is displayed above the mantle, on which sits a wonderful mantle clock. The shelves are filled with dozens of handcrafted books. 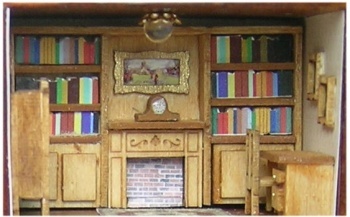 A Desk, chair, and grandfather clock complete the furnishings. All of the details mentioned above are included in this great kit. Potted Plant and other artwork not included.